A Public Hearing was held on June 21, 2018 at 5:30 pm in Lemoore, CA. The Proposition 218 ballots were tabulated and results announced with 74% of votes in favor of the $9.80/acre assessment. Votes were weighted by acreage; 63% of the 65,658 acreage included in the election voted. The Board set the rate at $9.80/acre for the fiscal year 2018-19 to be levied on landowners within the South Fork Kings GSA. The City of Lemoore entered a cost sharing by agreement on behalf of all property (5,655 acres) in the City limits and has incorporated the ongoing payments into their existing rate structure. To determine if your property lies within the South Fork Kings GSA, you can use this CA DWR map tool. Type your address into the search bar at the top left of the page to locate your GSA. An unfunded California law, the Sustainable Groundwater Management Act (SGMA) requires better management and balance of groundwater supplies in a groundwater subbasin through the creation of local Groundwater Sustainability Agencies (GSAs) with extensive powers to manage groundwater. A fee is necessary to cover the costs to follow the new State law within its stipulated deadlines. Based on the Agency’s needs, the South Fork Kings GSA Board of Directors conducted and successfully passed a Proposition 218 Election for landowner approval to levy an assessment. The assessment will generate sufficient revenue to fund annual Agency operational costs and expenses associated with the development and initial implementation of a Groundwater Sustainability Plan. The $9.80/acre assessment will be levied on all landowners within the boundaries of the South Fork Kings GSA via Kings County tax rolls starting fiscal year 2018-19. The City of Lemoore entered a cost sharing by agreement on behalf of all proprty (5,655 acres) in the City limits and has incorporated the ongoing payments into their existing rate structure. Compliance with the State law is not optional. SGMA stipulates that local GSAs must develop a Groundwater Sustainability Plan by January 31st 2020; failure to do so will trigger State Intervention. Funding the development and implementation of a GSP through the proposed fee is crucial to achieving compliance at the local level. The South Fork Kings GSA Board is dedicated to navigating SGMA together as a local community of stakeholders. Implementing SGMA at the local level allows stakeholder input and provides for solutions that carry benefits to our region. In the case of State Intervention, the California State Water Resources Control Board (SWRCB) would impose a fee structure on groundwater pumpers many times more costly than what is proposed by the South Fork Kings GSA, and is likely to impose unfavorable restrictions without providing local benefits. The cost of State Intervention far exceeds the cost of local implementation, and does not carry the same benefits for the local community. The graph below shows the South Fork Kings GSA fees for an average 40 acre parcel versus the State fee structure in the case of State Intervention. The South Fork Kings GSA Board is committed to retaining local control over SGMA implementation, where landowner dollars are utilized most efficiently and beneficially. To fund these efforts the Board conducted a Proposition 218 election for approval to levy assessments on landowners within its jurisdiction. The affected landowners includes all parcel owners within the boundaries of the South Fork Kings GSA. The proposed $9.80/acre fee has a lifetime of 5 years, at the end of which the GSA may hold another Proposition 218 election for additional funding needs. At the March 15, 2018 Board meeting, the Directors of the South Fork Kings Groundwater Sustainability Agency approved the Engineer’s Report to conduct a Proposition 218 Election. The Engineer’s Report is prepared in accordance with State law to describe an equitable distribution of the benefit assessments to be derived by each parcel within the Agency upon which such assessments will be levied. The Engineer’s Report discusses benefits of the Agency’s organization, proposed actions, and services provided by the South Fork Kings Groundwater Sustainability Agency. The Agency has landowner approval via Proposition 218 Election to levy assessments up to the maximum amount shown in the table below, specifically $9.80/acre for all parcels. The components that make up the total are shown in the table below (click to enlarge) and are explained further in the Engineer’s Report. Note that the assessment amount levied by the Agency may vary from year to year, but will not exceed the maximum amount unless an increase is approved through a subsequent Proposition 218 proceeding. The necessary funding for the Agency will be reviewed annually by the Board and, depending on the funds projected to be needed for the year, may be approved up to the maximum ($9.80 per acre) assessment rate. The rate for Fiscal Year 2018/19 has been set at $9.80/acre. Sign-up below to the South Fork Kings GSA Interested Persons e-mail distribution list to receive notices of meetings and events. Proposition 218 is a Constitutional Initiative approved by the voters of California in November 1996 which requires new or increased assessments to be approved by affected landowners. Why did the South Fork Kings GSA go through an assessment election? An assessment is necessary to cover the costs to follow the requirements of the new State law. 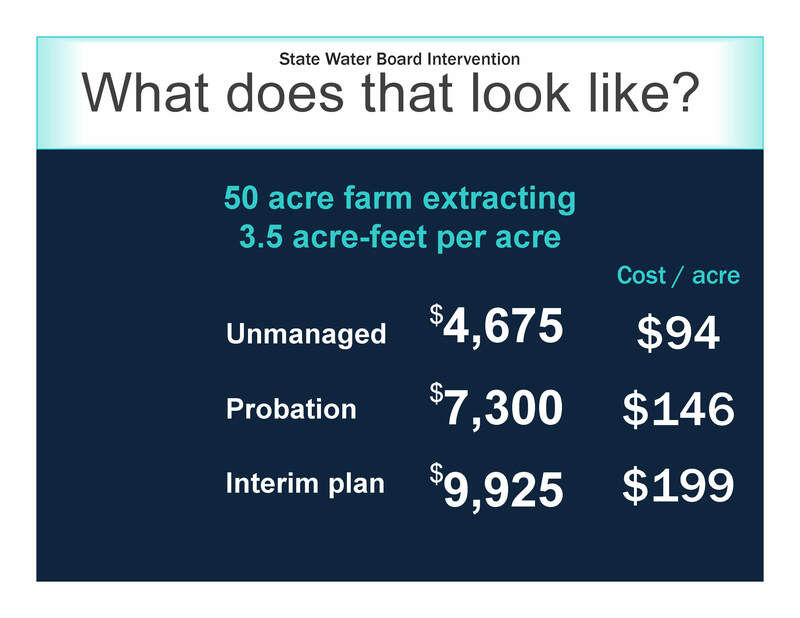 As an unfunded California law, the costs to prepare a Groundwater Sustainability Plan, administer a new agency, and any groundwater projects built will be borne by local landowners. What would happen if the election failed? 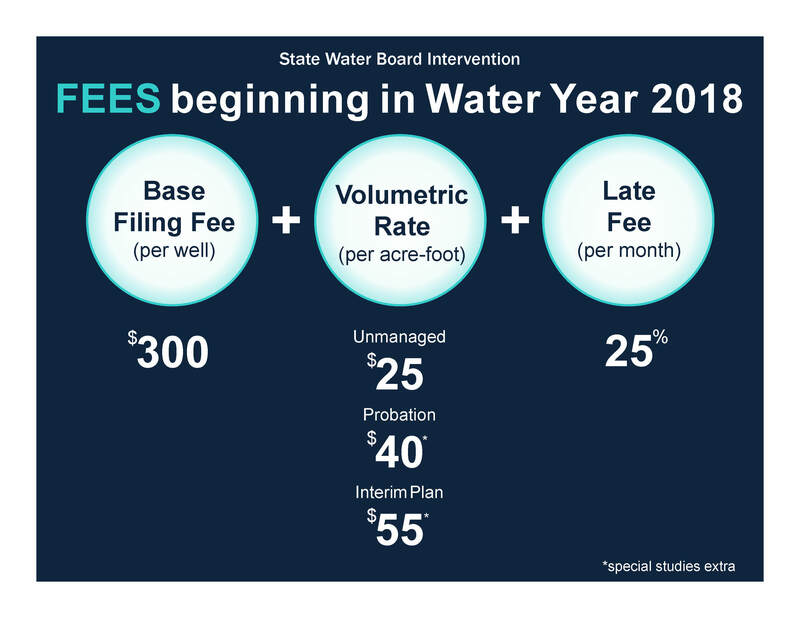 Failure to form a GSA or adequately manage the groundwater basin may subject the GSA to intervention by the State Water Resources Control Board. If South Fork Kings GSA is unable to raise funds to develop and implement an adequate GSP, the State could designate the basin as probationary and intervene to directly manage groundwater extractions and impose fees to recoup its costs of intervention. The State may impose fees within the GSA ranging from $41/acre to $195/acre with no guarantee of new or supplemental water supplies. By forming the GSA, collecting fees, and funding GSP activities, SFKGSA will provide landowners with a more affordable option for managing the basin. The South Fork Kings GSA successfully passed a Proposition 218 Election and adopted a $9.80/acre assessment. What is the assessment amount? The South Fork Kings GSA Board has adopted a maximum rate level of $9.80 per acre for all parcels within the territory of the GSA. The Board will review the financial need annually and set an fee accordingly up to the $9.80 per acre maximum. How will the assessment be collected? The $9.80/acre assessment will be included on your Kings County tax bill beginning fall 2018. Is the City of Lemoore included in the assessment? Yes. The City of Lemoore will participate in the Groundwater Sustainability Agency cost sharing by agreement on behalf of all property in the City limits and has incorporated the ongoing payments into their existing rate structure. How was the assessment determined? An Engineer’s Report was prepared by a registered professional engineer. To determine the amount to be assessed the engineer had to follow several requirements, the most important being the rate must substantiate a special benefit to the landowner and cannot exceed the reasonable cost of the special benefit associated with that parcel. The charges will commence July 2018. The charge will be included on your Kings County tax bill beginning fall 2018. Administration of the GSA and implementation of the GSP will be ongoing expenses, but other funding sources may be obtained at some time in the future that would reduce or eliminate the assessment. The $9.80/acre assessment has a 5-year duration, after the end of which the South Fork Kings GSA would need to conduct another election for approval to collect further assessment. The funds will be used to cover the administration of the South Fork Kings GSA, the preparation of a Groundwater Sustainability Plan, and the initial implementation of the Plan. The Board adopts an annual budget, reviews and authorizes payment of expenses at regular public meetings. The GSA is audited annually by an independent accounting firm. 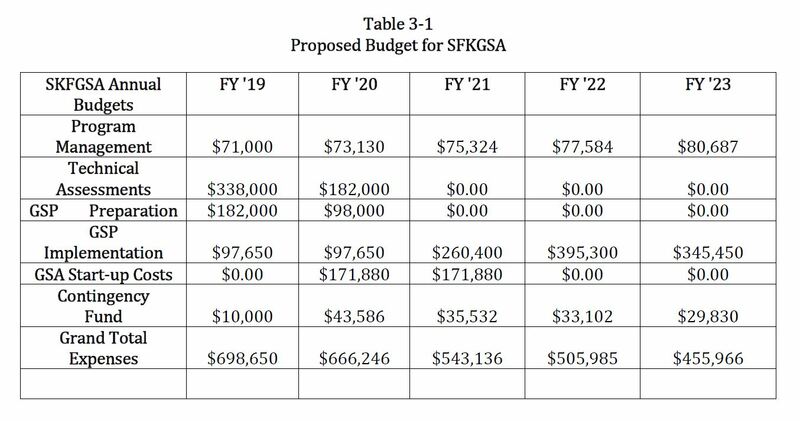 The South Fork Kings GSA Board has minimized expenses by using member agency staff, assistance from community volunteers and local non-profits, and reducing the use of consultants wherever possible. There are six GSAs including the South Fork Kings GSA in the Tulare Lake Subbasin. All of the GSAs are contemplating similar Prop 218 elections. The South Fork Kings GSA has and will continue to apply for grants to support its work. In addition to landowner assessments, groundwater extraction fees or other revenue generating measures may be considered in the future but are not authorized by this election.